The Portway range of stoves are some of the best on the market and as they are available in a range of sizes will be perfect for almost anyone looking for a stove. The Portway Peldon is the gas stove of the range, smaller in size but the 4Kw heat output is more than adequate to heat the average sized living room. The unique, one-piece main body construction and 'clear view' window combine with the realistic coal and flame effect to really create the feel of a traditional cast iron stove with increased efficiency and flexibility, being suitable for almost any chimney or flue. The quality of the Portway stoves is unmatched, all bodies made from tough 5mm steel, the most robust on the market with cast iron grates and doors. The bodies are then shot blasted to provide the texture and can be finished in either Charcoal or Black metalised siloxane paint. This finish is more durable and of a higher quality than that of traditional stove paint. All the Portway stoves feature an pre-heated air-wash system that passes a stream of hot air down the inside of the glass preventing flames and products of combustion from ever touching the glass and keeping it clean. All the Portway freestanding stoves can be flued from either the top or the rear and connect to a standard 6" stove flue pipe and at 80% efficiciency, Portway stoves are amongst the most efficient on the market and give out more heat while burning less fuel. The multi-fuel stoves are capable of burning a large variety of natural or man-made fuels such as peat, straw, sawdust, briquettes as well as most mineral fuels. The windows of the Portway multi-fuel stoves can be tailored to suit with a variety of window trim options. The Portway 1,2 and Inset models can be customised with Suburst, Square, Fleur and Gothika or left plain for the maximum view of your fire. These when combined with either standard, ruby red or arctic grey enamel door help draw attention to this stove and make it the centre of attention. 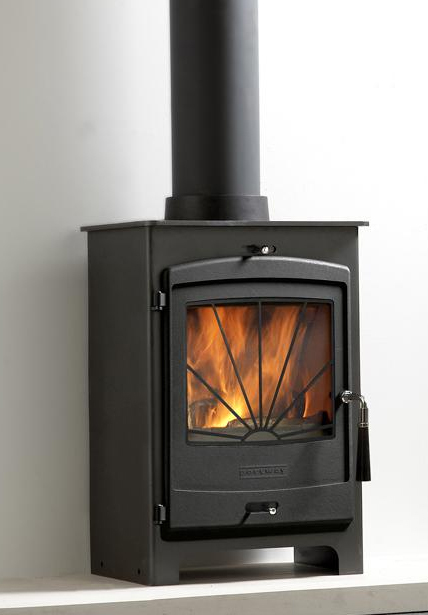 The first multi-fuel stove of the Portway range is the Portway 1. This stove is the smallest of the range featuring an ultra-slim body that retains the large viewing window while allowing the stove to be fitted into a larger variety of fireplaces. The Portway 1 has a maximum heat output of 5Kw. The contemporary design of the 5mm steel can be customised with either an artic silver or ruby enamel finish to the door and a choice of three leg heights to further draw attention to this modern stove. The viewing window can also be decorated with a choice of trims, fleur, gothika, plain, square and sunburst which would again help this stove become the centrepiece of any living room. The Portway 2 is the mid-range Portway multi-fuel stove which as the smaller stove is made of tough 5mm steel with a cast iron door available in either Arctic Grey or Ruby Red Enamel, which, again when coupled with a stylish window trim can really add to the contemporary styling of the stove. The simple operating controls with multi-function handle allow opening of the door and movement of the controls using patented magnetic technology. The three different leg lengths can allow the space underneath to store logs and to further add a more contemporary look to this multi-fuel stove. The largest stove in the range is the Portway 3, a double door traditionally styled stove that features two large viewing windows that allow the best view of the fire inside. The ultra-slim, extra-wide design designed specifically designed without the need for a protruding hearth. The extra-wide design allows logs up to 21" to be easily accomodated and the cast iron grate with easy-clean and easy to carry ashpan combine to ensure ease of use while getting the most out of the Portway 3. The final stove in the range is the Portway inset multifuel stove, for those who like the look of the contemporarily designed Portway stoves but without the open fireplace to put one in. The Portway inset is perfectly designed to fit a standard 16"x22" opening while still maintaining a generous viewing area of the fire inside. The contemporary styling allows this stove to fit in with most modern living room decor and the high output of 4.5Kw provides enough plenty of heat for a normal living room. Like the Portway 1 and Portway 2 this stove can be customised with the enamel door and detailing on the large viewing window, these features make this product even more unique and set it apart in the field of inset stoves.